Then we decided to go ahead and put these two closer together than 2 years and so some major discussions had to be had about sleeping arrangements. My wonderful husband could care less about what the decision is. Not because he doesn't care, but more because he knows I'm the one that has to deal with it more often than he does. And I've been lectured and chastised by many about how Sarah needs to be moved into a big girl bed before the new baby comes. Almost to the point that I want to smack someone and tell them to back off! To me, the crib guarantees a nap. Sarah is remarkably good about going down for night night and she doesn't fight being put in her crib for naps. But she is awake in there playing for a bit before she falls asleep. Usually after I put her down for a nap I can hear her for about 20 minutes playing with her stuffed animals and talking to herself. She happily goes down for the night at 7:00. But we've heard her in there talking and playing until 7:45 a couple of times just because it's not dark until after 8. But the fact remains that because she's contained she does eventually fall asleep and I don't have to worry about what she's getting into or pulling out! I'm worried that by giving her free access to her toys and books she'll stay up playing long after she should go to sleep. And since she was never a baby to play herself to sleep I don't think she would actually do that. I think she'd eventually start banging on the door and begging to be let out. Or not get good enough rest and be a crazy cranky face. So I'm just not ready and that's all there is to it. And it's my perrogitive to leave her in a crib until she starts trying to climb out or it's just ridiculous to lift her up and put her in. And if you notice the crib has a bead board detail to it like the bed that Chris built. So they look really good together in the same room. So two major elements of the nursery are ready to go. And this is a huge improvement over my preparations for Sarah. I've got 7 weeks to Cody's D-day and his crib is already assembled. 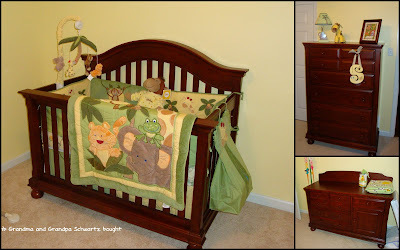 7 weeks out from Sarah's D-day I was finally ordering a crib! Ha! Now this isn't to imply the nursery is ready. It's not. I want to customize the closet with some new shelves and fabric bins instead of putting a dresser or chest of drawers in the room. That's on Chris's to do list next weekend when I go visit my parents. And we also need to cut the mats and frame the prints I bought a long time ago before we can unveil the theme for Cody's room. But all and all we're on our way to getting ready for the ba-bay! That's a nice spare change crib. I think you always have to do what you think will work best. You move a child out of the crib when the child is ready--not when one other mom says you should. Plenty of people end up having two cribs set up at once. I swear I typed in "some" as in "some other mom"